We’ve announced our well known list of “Worst Passwords” for 2015 — check out the press release and see a cool infographic we created for this year. SplashID 8 is now available in the shape of an all new Windows desktop app. Download the new apps today! The 2014 list of worst passwords demonstrates the importance of keeping names, simple numeric patterns, sports and swear words out of your passwords. We announced our annual list of the 25 most common passwords found on the Internet – thus making them the "Worst Passwords" that will expose anybody to being hacked or having their identities stolen. In its fourth annual report, compiled from more than 3.3 million leaked passwords during the year, "123456"and "password" continue to hold the top two spots that they have held each year since the first list in 2011. 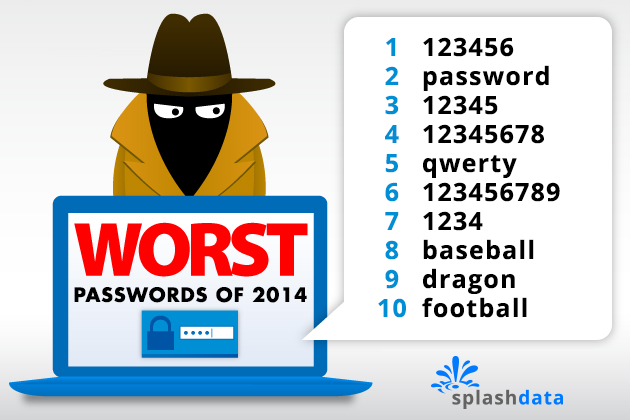 Other passwords in the top 10 include "qwerty," "dragon," and "football." According to SplashData, the passwords evaluated for the 2014 list were mostly held by users in North America and Western Europe. In 2014, millions of passwords from Russian accounts were also leaked, but these passwords were not included in the analysis. "Passwords based on simple patterns on your keyboard remain popular despite how weak they are," said Morgan Slain, CEO of SplashData. "Any password using numbers alone should be avoided, especially sequences. As more websites require stronger passwords or combinations of letters and numbers, longer keyboard patterns are becoming common passwords, and they are still not secure." For example, users should avoid a sequence such as "qwertyuiop," which is the top row of letters on a standard keyboard, or "1qaz2wsx" which comprises the first two 'columns' of numbers and letters on a keyboard. This is the first year that SplashData has collaborated on the list with Mark Burnett, online security expert and author of "Perfect Passwords" (http://www.xato.net). "The bad news from my research is that this year's most commonly used passwords are pretty consistent with prior years," Burnett said. "The good news is that it appears that more people are moving away from using these passwords. In 2014, the top 25 passwords represented about 2.2% of passwords exposed. While still frightening, that's the lowest percentage of people using the most common passwords I have seen in recent studies." Slain says, "As always, we hope that with more publicity about how risky it is to use weak passwords, more people will start taking simple steps to protect themselves by using stronger passwords and using different passwords for different websites." 1. Use passwords of eight characters or more with mixed types of characters. 2. Avoid using the same username/password combination for multiple websites. 3. Use a password manager such as SplashID to organize and protect passwords, generate random passwords, and automatically log into websites. SplashID 8 is available now on iOS, Android, and the web! It used to be every time I needed to share a password with a colleague or family member, I'd feel a little uneasy. I didn't want to send it over email or text, where it would live indefinitely, so I would call and spell it out. Not anymore. With the release of SplashID Safe version 7.2, Cloud Services users can now use the Share Securely feature, which sends encrypted files directly to recipients. A cool feature of Share Securely is that it identifies other SplashID Cloud Services subscribers and lets them know they have records to import the next time they login to SplashID. The records never go outside the system! And what if you send the records to someone who doesn't use SplashID Safe? They will get a one-time web link to view the records that self-destructs after 24 hours or after viewing. Neat! To send a single record, click the Share Securely button under the record details in any version 7.2 or later client. On the mobile app, you can also go to Settings > Share Securely, and select multiple records to share at once. Enter the email address of the person you wish to share it with, set a password, and decide if you want to include that password in the email. To be even more secure, choose not to include the password, and let them know the password separately. Which platform(s) is it available on? Hope you like Share Securely and our other new features in version 7.2. Thanks again for your dedication to good password management and your loyalty to SplashID Safe! With all the hacking, spying, and general lack of online security these days, it's good to know that SplashID Safe is protecting your logins and other sensitive records. But you can never be too safe, so we're raising to bar with 2-Factor Authentication to protect you against unauthorized access of your SplashID data, even if someone discovers your username and password. With the release of SplashID Safe version 7.2, Cloud Services users can now enable 2-Factor Authentication, which will require you to enter an authorization code received via email when attempting to login on a new computer, device, or browser. You may have seen this kind of authentication for your online banking applications, and we felt SplashID Safe deserved the same level of protection. Login to your SplashID Cloud Services account on your desktop web browser. Then click the Settings tab on the left, then click 2-Factor Authentication. Check the box next to "Enable 2-Factor Authentication" and click Save. Next time you log in to SplashID Safe from a new browser, desktop, tablet or phone, you will be required to enter a 6-digit code, which you'll receive via email. Once you enter the code, you won't be asked for the code again on that browser or device. If you want to authorize access on a new browser or device, you will need another authorization code sent. 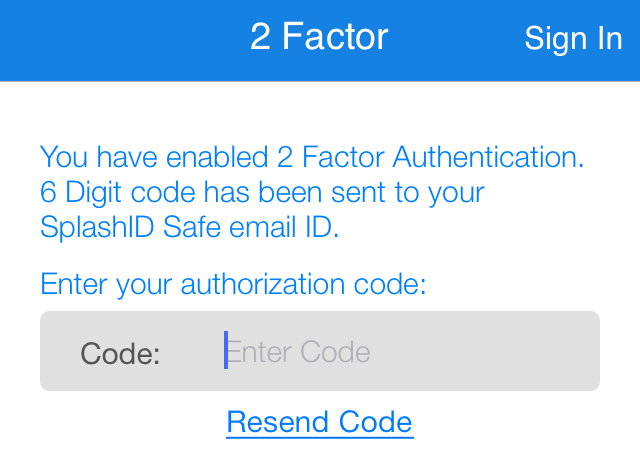 Hope you like 2-factor authentication and our other new features in version 7.2. Thanks again for your dedication to good password management and your loyalty to SplashID Safe! 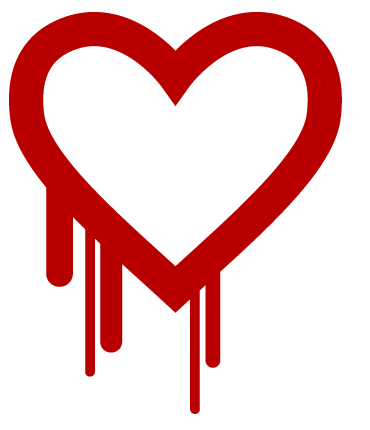 SplashID Safe is not affected by Heartbleed! Since SplashID Cloud Services is run on Microsoft IIS servers, and not Linux or Unix servers, it does not employ the Open SSL library that contains the Heartbleed vulnerability. That said, this is a widely used library that will affect many of the websites you login to, and this vulnerability has existed for some time, so we recommend that you change passwords on all sensitive sites at this time to be safe. You can use the password generator feature in SplashID Safe to generate strong passwords and save them in your SplashID records for easy (and secure!) recall. If you're like us, you love the convenience of using Cloud Services to access your SplashID records anytime without worrying about sync or backups, but there may be some especially sensitive records (perhaps bank accounts or family social security numbers) that despite all the security measures you'd still prefer to keep stored only locally on your desktop. With the release of SplashID Safe version 7.2, Cloud Services users can now designate any record in SplashID Safe as Local Only. This means the record stays local on the device selected and does not sync to the cloud server. If the selected record is already on the web app or on any other devices running SplashID Safe, it will get deleted from those apps. At any point, you can undo the Local Only setting, and the record will sync back to the cloud server and appear on all your devices. iOS: Tap a record. In the bottom toolbar, tap on "Make local." This change saves automatically. You can change it back by tapping "Sync to Cloud." Android: Tap a record, then tap the edit button. Scroll down and set "Local Only Record" to ON. Save. Windows Phone: Tap on a record, and tap to edit. Scroll down, and check the box for "Local Only." Save. Windows: Double click on a record to view the edit screen, and check the box for "Local Only." Save. Mac: Double click on a record to view the edit screen, and check the box for "Local Only." Save. This blogger mentions SplashID Safe as a tool to use in the fight to protect your online identity. Old so-called "Zombie Accounts" are one risk to keep in mind. You need to be vigilant in order to track all the user accounts you create online and make sure they don't come back to haunt you. Here's our annual list of the 25 most common passwords found on the Internet. For the first time since SplashData began compiling its annual list, "password" has lost its title as the most common and therefore Worst Password, and two-time runner-up "123456" took the dubious honor. "Password" fell to #2. According to SplashData, this year's list was influenced by the large number of passwords from Adobe users posted online by security consulting firm Stricture Consulting Group following Adobe's well publicized security breach. "Seeing passwords like 'adobe123' and 'photoshop' on this list offers a good reminder not to base your password on the name of the website or application you are accessing," says Morgan Slain, CEO of SplashData. SplashData's list of frequently used passwords shows that many people continue to put themselves at risk by using weak, easily guessable passwords. 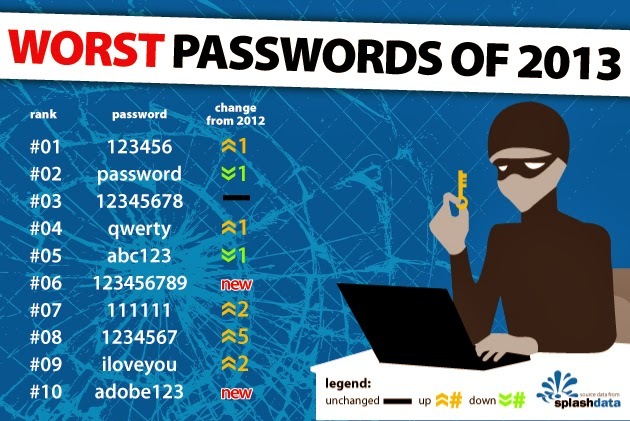 Some other passwords in the Top Ten include "qwerty," "abc123," "111111," and "iloveyou." "Another interesting aspect of this year's list is that more short numerical passwords showed up even though websites are starting to enforce stronger password policies," Slain said. For example, new to this year's list are simple and easily guessable passwords like "1234" at #16, "12345" at #20, and "000000" at #25. SplashData, provider of the SplashID Safe line of password management applications, releases its annual list in an effort to encourage the adoption of stronger passwords. "As always, we hope that with more publicity about how risky it is to use weak passwords, more people will start taking simple steps to protect themselves by using stronger passwords and using different passwords for different websites." SplashData's top 25 list was compiled from files containing millions of stolen passwords posted online during the previous year. The company advises consumers or businesses using any of the passwords on the list to change them immediately. Avoid using the same username/password combination for multiple websites. Especially risky is using the same password for entertainment sites that you do for online email, social networking, or financial service sites. Use different passwords for each new website or service you sign up for. Having trouble remembering all those different strong passwords? Try using a password manager application that organizes and protects passwords and can automatically log you into websites. There are numerous applications available, but choose one with a strong track record of reliability and security like SplashID Safe, which has a 10 year history and over 1 million users. SplashID Safe has versions available for Windows and Mac as well as smartphones and tablet devices.